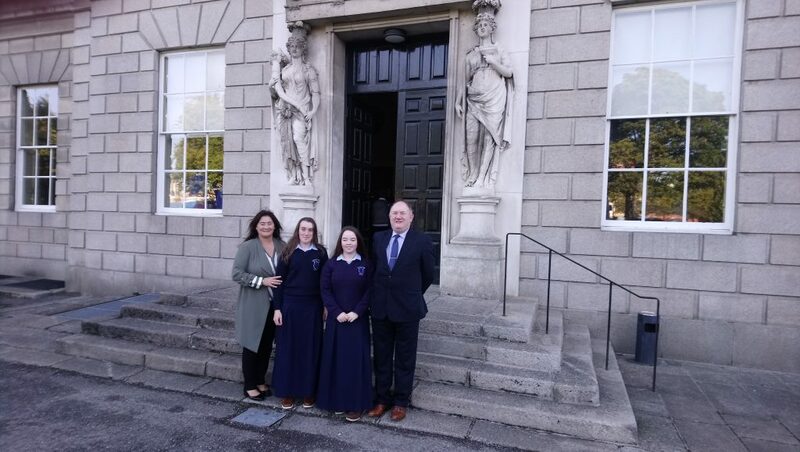 On Wednesday September 12th last in the Kings’ Inns in Dublin two students and two teachers from St. Anne’s Community College Killaloe accepted the Cycle Against Suicide Ambassador Schools Award from Minister Helen Mc Entee T.D. European Affairs Minister and former Junior at the Dept. of Health with responsibility for Mental Health. 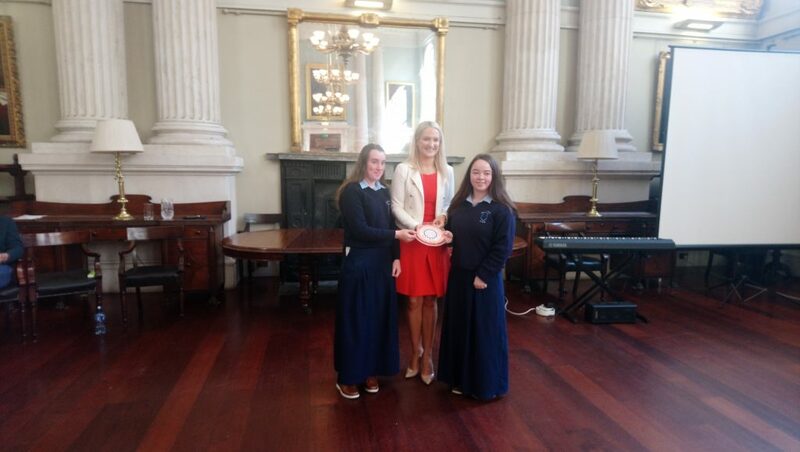 In the 2017-18 academic year the Transition Year students undertook to fulfil a number of actions or criteria to achieve this award. 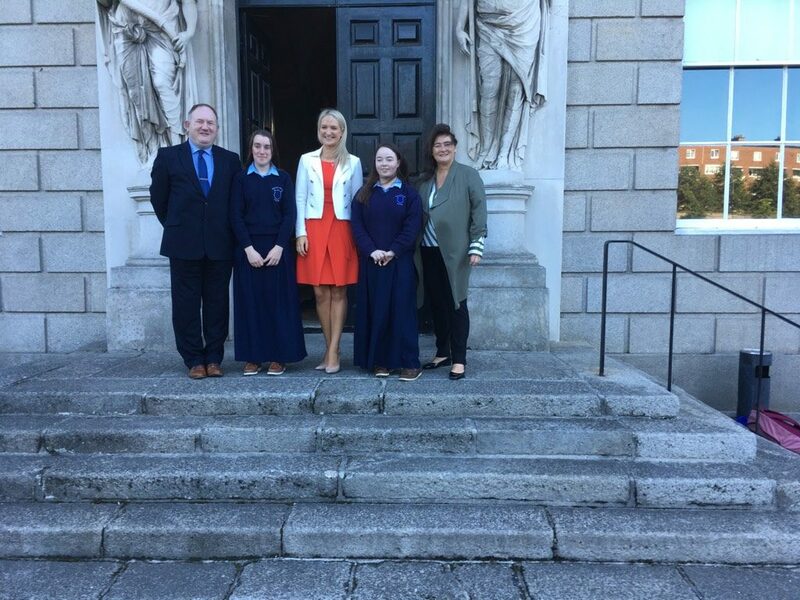 Through their Young Social Innovators module in TY the students along with their teacher Ms. Ann Lane O’ Connell engaged with the school and local community on the topic of mental health. One particular initiative that struck a chord was the ‘Go Orange Day’ at school when, for example, one particular action whereby positive messages on orange stickie notes and a sweet were left on the desks of the Junior and Leaving Cert students prior to the commencement of the Mock Exams. Fundraising and an information leaflet for the local community were the other initiatives undertaken by the students. The genesis of the project came from parent Graham Tuohy of Killaloe, himself a past student of St. Anne’s Community College and a marshal for the Cycle Against Suicide. 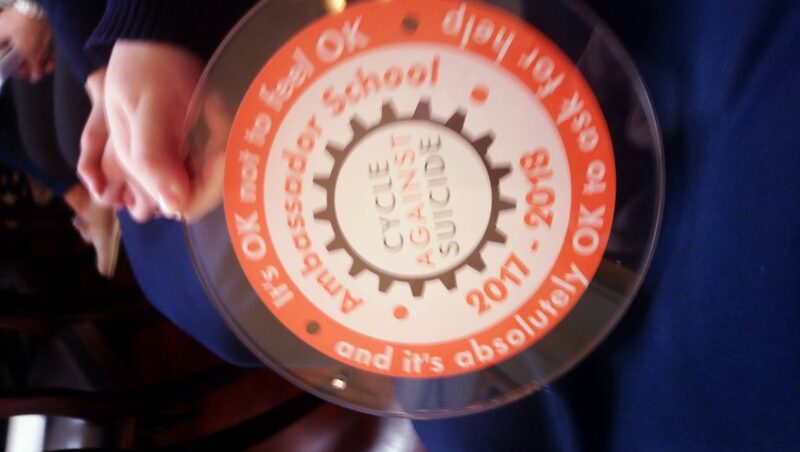 Graham’s daughter Kayla and her classmates in Transition Year enthusiastically set about raising the profile of Cycle Against Suicide and the importance of mental well-being for the whole community. This is not the first time the students in the college have engaged with the issue of mental health having previously co-operated with the Samaritans, Pieta House, Aware, Clare Sports Partnership, the Soar Foundation and the Family Resource Centre to actively promote positive mental and physical health in the school and community. The students also participate annually in the Darkness Into Light Walk in Killaloe-Ballina. Cycle Against Suicide is a national awareness charity that strives to break down the barriers around mental health illness and works to increase awareness of the supports and treatments that are available to empower those affected. Since 2013 Cycle Against Suicide, along with over 15,000 cyclists have helped to spread the message that “It’s OK not to feel OK; and it’s absolutely OK to ask for help”. As an Ambassador School, St. Anne’s Community College Killaloe looks forward to welcoming the cyclists to Killaloe in April 2019 and to providing a warm welcome and hospitality to those involved. By killaloeteacher in Other on September 15, 2018 .